Quadruple Bunk Bed Plans easy to follow. Four beds in the footprint of one! 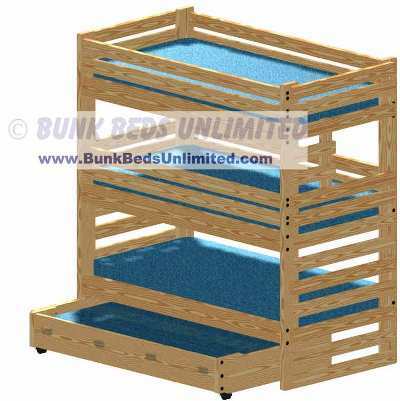 Simply add a trundle beneath a triple bunk bed to make a quadruple bunk bed. See the options on the triple with drawers below. Need Space? We can help. Yes, it holds 4 people! This is a triple bunk bed plan with a trundle bed that tucks away neatly beneath. This is great in vacation homes, beach houses, dormitories and about anywhere that space is a premium. It is easy to build and will stand up to extreme use (seriously) for years. It does require that you have ceilings of 9 feet or greater in order to give the top bunk enough headroom. If you have questions, please call us at 877-671-4931.